Their task has been known since the dawn of time, to decide who lives or dies on the battlefield. Who gets condemned to the flames of Helheim, or live with the gods in the halls of Valhalla? The burden of such a task is not for all. Enter the Valkyries! Norse Mythology centers around the Valkyries and gods of Midgard, from the fires of Helheim, through Jotunheim all the way up to the heavens of Asgard. With Freya, the goddess of Love, your journey through the worlds of Midgard begins. The Valkyries are at your service, their weapons are your tools. Gane, Helena, Andora and Tyrsa will help you on your quest. Are you ready to fulfil your destiny? 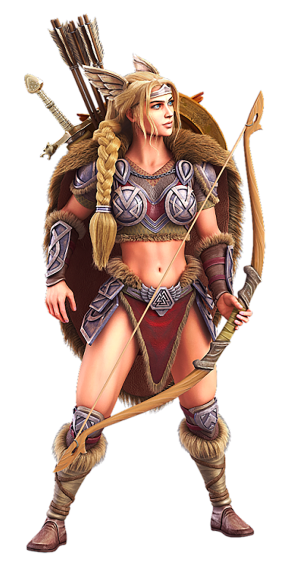 Valkyrie is a 5 reel 4 row slot with a Nordic mythology theme. It is stacked with free spins, wild symbols and “EPIC” reel symbols that come in the sizes 2×2, 2×3 and 3×3. The game also presents three exhilarating bonus features: The Shield of Chance, The Arrow of Fortune and The Sword of Destiny. Three Free spins symbols award the player 5 free spins, four Free spin symbols awards 7 free spins and five Free spin symbols awards 10 free spins. Free spins in Valkyrie can be retriggered, adding up to 10 new free spins again and again. The player is guaranteed one Bonus Spin during 5 free spins, two Bonus Spins during 7 free spins and 3 Bonus Spins during 10 free spins. The Bonus Spin triggers randomly. The reels light up and the player receives three to five Bonus symbols. This will trigger any of Freya’s three features: The Arrow of Fortune, The Shield of Chance or The Sword of Destiny. The Bonus Spin is progressivly built, meaning the more Bonus symbols you get, the greater the chance for big wins. As Freya raises her shield, channeling the power of Odin, she lights up the reels. Multiple Wild shields rain down on the spinning reels. All shields sticking to the reels become Wild, giving the player a big chance of a massive payout. Freya raises her sword, wielding its mighty power. Magically charged swords fly over reels 2, 3 and 4. A sword that lands on a reel turns the whole reel Wild. Swords landing on all three mid reels maximizes the win potential. Freya raises her bow, takes aim at the heavens of Asgard and shoots up to three arrows. As they land and the fires fade away, epic symbols are revealed in 2×2, 2×3 or 3×3 sizes. The Arrow of Fortune is a force to be reckoned with, and the potential reward is beyond comprehension. J. R. R. Tolkien has told that both The Hobbit and The Lord of the Rings were heavily influenced by Norse mythology. As an example, Gandalf the wizard takes his name and appearance from Norse figures such as Odin.